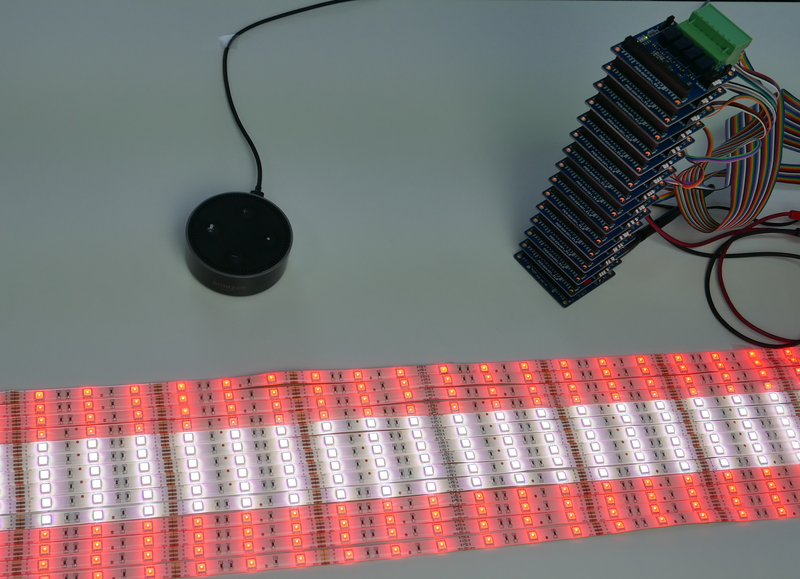 This project allows you to use voice command to turn on/off, change color, effect of one, a range or all of an LED strip. Step 5: Writing source code on PHPoC to handle commands and control the devices. Every step is almost the same, there are only some difference on interaction model configuration and source code. You can do step by step on that link. I only show the differences in this article. This code will handle "intent" from Alexa Skill and extract the necessary data, format it in json format and publish on a MQTT topic. This code subscribe a MQTT topic and handle MQTT message which contains LED state, effect and LED numbers. RGB LED strip required 12V power source. Therefore, we need to use relay to control the LED. Each strip need 3 relays to control three colors lines. I use 14 strips, so I need 42 relays. Each PHPoC 4-Port Relay Expansion Board has 4 relays. In order to simplify the wiring and source code, I use 14 Expansion Boards. Each board connect to one LED strip. * Sets the led in the session and prepares the speech to reply to the user.